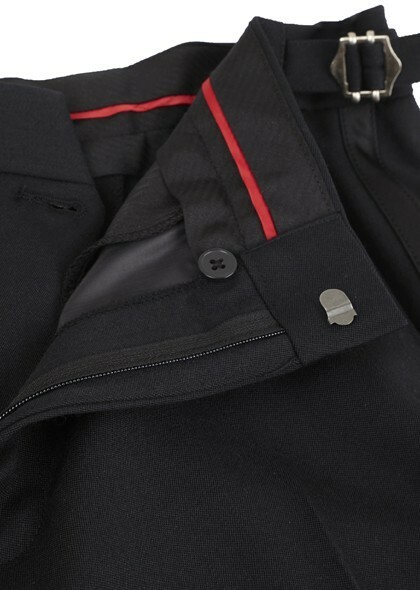 Outer: 100% wool outer professional dry clean only. Lining: 100% polyester lining. Professional dry cleaning. Always clean both parts of a suit together. UK delivery charges (1 - 2 working days): £4.95 for orders under £100. Free for orders over £100. We hope you’ll love every Johnny Tuxedo purchase, but if you ever need to return an item you can do so within 14 days of receipt, however for a custom product we cannot except returns except for quality issues. For full details of how to make a return, please view our Delivery and Returns Information. Midnight blue not black and 100% wool woven in Leeds, England at a family run mill that was established in 1915. This is Johnny’s best tuxedo yet. All Savile Row tailors would say that dinner wear should be midnight blue not black. Midnight is the darkest navy blue and has the effect of looking blacker than black in low light. 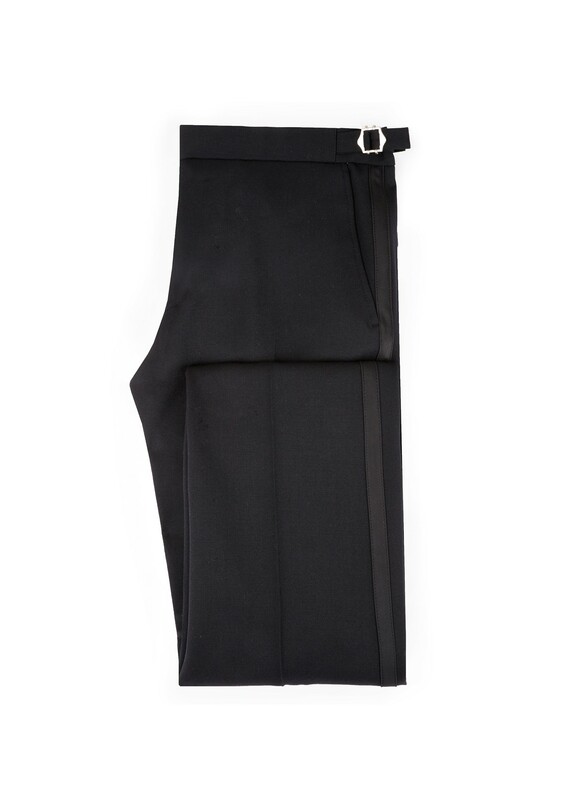 Our trousers have a slim modern fit, satin tape down the side seam and metal side adjusters. Only 350 have been made so order one while you can. Modern tailoring, classic style, redefining black and white. Don't mess it up. Use our size charts to make sure you buy the right size first time. For more information on how to measure yourself to get that perfect fit, visit Johnny's Size Guide. Length Short 27 1/2" 27 3/4" 28" 28 1/4" 28 1/2"
Regular 28 1/2" 28 3/4" 29" 29 1/4" 29 1/2"
Long 29 1/2" 29 3/4" 30" 30 1/4" 30 1/2"
Neck 14" 14 1/2" 15" 15 1/2" 16"
Sleeve length 25 1/4" 25 1/2" 26" 26 1/4" 26 3/4"